I’m excited to announce that coming out on January 23rd, I’ll have a new short story available from Amazon, titled The Freeport Mutineers. The Freeport Mutineers is a short story set in the Eoriel Saga universe, just after Admiral Hennings has seized the town of Freeport. Wrath of the Usurper Available Now! 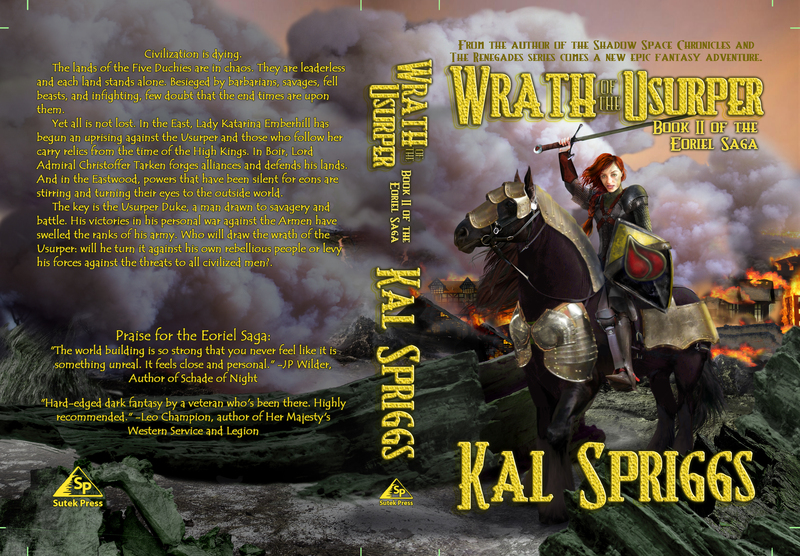 Wrath of the Usurper is now available on Amazon and will be available soon in paperback form. If you’ve missed the snippets from it, they are here, here, and here. The cover was made by the very talented Zoe Frasure. Yet all is not lost. In the East, Lady Katarina Emberhill has begun an uprising against the Usurper and those who follow her carry relics from the time of the High Kings. In Boir, Lord Admiral Christoffer Tarken forges alliances and defends his lands. And in the Eastwood, powers that have been silent for eons are stirring and turning their eyes to the outside world. You can buy it from Amazon now! Here’s the third scene from Wrath of the Usurper for your reading pleasure. As a reminder, Wrath of the Usurper comes out tomorrow, May 30, 2015. The first two snippets are available here and here. Aerion ducked under a blow and brought his shield around to block another. Aerion’s face was drawn in concentration. His opponent struck again, faster than he had expected and far faster than he could react, and the blow caught him painfully in the left arm. His wooden practice blade spun out of his numb arm, his fingers unable to hold its weight. “So quickly, then, Swordbreaker? You may one day find yourself fighting without a blade, perhaps it wouldn’t hurt to practice that,” Simonel Greeneye said with a smile as he lowered his own practice weapon. The other man didn’t use a shield or another weapon in his off hand, instead he wielded the long blade ambidextrously and sometimes with two hands. Of course, his ‘practice blade’ was almost as ornate as his actual sword, what Aerion had heard called Mede Khmali. Simonel was tall for a Wold, a bit taller than Aerion’s own six feet of height, lean and muscular. His long, raven black hair normally hung free, though for their sparring session he had it braided, while his reddish bronze skin had a light sheen of sweat. Aerion, on the other hand, was well aware that his blonde hair, pulled back into a tail for the sparring session, had come loose and was sodden with sweat. His skin and clothing were both drenched as well, and he caught a whiff of himself, a mix of rust and oil from his scale mail and sweat from exertion. The tall Wold was disgustingly capable, to the point that Aerion had come to judge his own success not on scoring hits, but upon lasting a few seconds longer in one of their sparring sessions. Aerion flushed a bit, but he gave the other man a smile. Ceratul was the Wold’s Warmaster, their military commander, though, from what he had seen, Simonel took a large part of that authority himself. While Amelia, the other royal guest, had said that Ceratul seemed to dislike non-Wold in general and Starborn in particular, Aerion had found Ceratul to be nothing but friendly. “Though if we doubted that, our first meeting would have proven your determination,” Ceratul said. Aerion shook his head at the reminder. The long, running fight that had led him to the Eastwood was almost a blur now. He was more amazed at his own survival than anything else, particularly after the fight in the ravine where he had faced a seemingly unending stream of Armen raiders and their Noric allies. Aerion had led them away from Lady Katarina and the rest of his friends, fully expectant that he would not survive, yet the Wold had appeared at the last minute, apparently drawn by the horn he had found in the ruined fortress of Southwatch. Aerion bent to pick up his practice blade. It was new, made by one of the Wold craftsmen, and it was almost exactly the same weight, length and shape as the broken blade he had also found at Southwatch. When Simonel had first offered to spar and Aerion had declined with the excuse that he only had the weapons he carried. The next day, the Wold King had gifted him with the weighted wooden practice blade. Aerion felt his face flush at the title. He had told Amelia about the label given to him by his friends, for his knack of breaking every sword he’d ever taken into combat. The only exception was the broken blade he’d retrieved at Southwatch. Since that’s crafted out of star metal and already broken, Aerion thought dryly, that isn’t saying much. Still he hadn’t expected the Boir noblewoman to take such glee in spreading the story. Yet the amusement that the Wold showed when they used the title was tempered with something like respect, Aerion knew, which embarrassed him all the more. I’m a low-born, commoner, from a remote village, who will never know his father’s name, Aerion thought, somewhat bitterly. He knew he had accomplished much, but he also felt uncertain about the praise, almost as if he took credit for the deeds of someone else. “Indeed,” Simonel said with a smile of his own. A moment later, without changing expression, he leapt forward into a lunge. Aerion managed to deflect it with his shield, but Simonel spun into a series of attacks, mixing fast slashes, lunges and blows from his feet and hands that forced Aerion to parry and block more and more desperately, until finally, the Wold King swept Aerion’s feet out from under him to drop Aerion on his back. Simonel offered him a hand and pulled Aerion to his feet. “Well fought, yourself, you’re improving, Aerion.” His voice was warm and reassuring, but Aerion didn’t miss an edge of something else there, almost concern, though he couldn’t guess why. “Thanks,” Aerion said, “Though I think I’m done sparring for the day.” Aerion was only eight cycles of age, he knew, but he still towered over many older men and many of the Wold. Aerion gave her a quick bow, “Thank you, Lady, but I’m afraid that King Simonel has the advantage.” While she had been friendly and seemed to adopt much of the Wold informality, she was still a Starborn noblewoman and part of Aerion rejected any notion of treating her as anything else. In the outside world, no one would care how he might interact with the Wold, who were almost mythical due to their isolation. However, a low-born commoner showing familiarity to a noblewoman was likely to have very bad things happen as a consequence. While he was unlikely to encounter Lady Amelia in the greater world, she wasn’t the one he was really worried about, he could privately admit. And it’s a good practice to maintain here, he thought, to better prepare myself for when I rejoin Lady Katarina. Even at that thought he felt his heart ache a bit. He had known all along that he should never dream of friendship, much less the attraction he felt for the exiled heir to the Duchy of Masov. Still, her words at Southwatch had hurt, especially the acknowledgment that she felt that same attraction… and that they could never give into it. Amelia’s companion cleared her throat and Aerion started a bit, realizing that he had paused longer than was socially acceptable. “Princess Tirianis,” Aerion nodded respectfully. King Simonel’s sister gave him a wicked smile in return, “So formal, still, young Swordbreaker? We’ll have to break you of that, else the outside world will come to doubt our savage ways and decadent natures.” She was almost as tall as her brother, with the same raven black hair and bright leaf-green eyes, though her skin was a red-gold color somehow softer than Simonel’s. Instead of Simonel’s leather sparring armor, she wore a green dress that clung to her figure in a fashion that would have made him blush and stammer only a few weeks earlier. Once again, Wrath of the Usurper will be available tomorrow, 30 May, 2015. Commander Kerrel Flamehair led Nightwhisper slowly down the ramp and onto the solid stone pier. Though the war horse did so with slow, calm steps, Kerrel didn’t miss the chuff of relief from her stallion as all four of his hooves stood again on dry, stable land. Kerrel rolled her eyes at that and led Nightwhisper out of the way while her second in command led his own horse down off the transport ship. Kerrel gave him a stern expression as he came down the ramp, followed by Jonal and his horse. “It’s a good thing I’m such a calm and patient sort, Baran. If I had any kind of temper then such language might draw penalties, especially were I given to letting my new promotion go to my head.” She tossed her head and her red hair swung over her shoulder. Normally she kept it tied back, but it had come loose during the unloading. “She might,” Jonal admitted after a moment. Kerrel grimaced. She had enjoyed a bit of respite from Lamar while operating under Lord Hector’s Northern Army. They had an entire logistics company to deal with paperwork and the actual movement of supplies and equipment. Sergeant Lamar knew his job and knew it well… but he had a tendency to take an unholy joy in drowning her and Baran in paperwork, all of it vital, but still dreary. “I guess I should let her Commander-ship get to her duties then,” Baran said gravely. “Glad to see you here, Jurgan, and mind the dark one. Nightwhisper has a wicked temper and likes to bite,” Kerrel said. She heard her horse chuff in disappointment behind her, but she ignored that. Her regular troops knew the horse’s ways, but someone like Jurgan would need the warning. She passed over the reigns and waved for Baran and Jonal to join her. A glance around the docks showed that the bustling port had taken no more notice of them. The traffic of mercenaries into the Duchy of Masov, called by the Usurper Duke’s offers of coin had become common here. Southern mercenaries took the bridge across the Ryft at the Ryftguard, but most mercenaries from Boir and Asador came in through the ports, and Longshaven was the largest port in the Duchy of Masov. “You know the way?” Baran asked. “Oh, I’ll trust you on that, all right,” Baran grunted. The Vendakar who had kidnapped Jonal and then framed him for the assassination attempt against Duke Hector had used drugged Vendakar wine, Kerrel remembered. That they had used his own enjoyment of fine food and drink against him had embarrassed him. That they had killed off the patrol he was supposed to ride with and then nearly killed Kerrel herself in the assassination attempt clearly still left him angry. Not that anything of Vendakar make was in high demand anywhere in the Duchy of Masov, just now. When the full measure of their treachery had come to light, they had switched sides mid battle, it had taken five companies of heavy cavalry, led by Kerrel herself to bring back the tide of victory. If their treachery had succeeded, they and the Armen they had sided with would have wiped out the Usurper Duke’s Northern Army. The Armen raiders that Duke Hector fought would have come south and raided the rest of the Duchy and presumably the traitorous Vendakar mercenaries would have taken their own measure of loot and slaves. As unpopular as the Usurper Duke might be, particularly in the south, no one had any complaints about his victory. Indeed, when word had gone out that it was open season on Vendakar merchants and mercenaries tied to the Houses who had plotted that betrayal, the popular reaction had been extremely violent. Since the Vendakar slavers had something of a reputation and there wasn’t a single Vendakar merchant who didn’t deal in slaves on the side… well, there were a lot of dead Vendakar within a few weeks of Duke Hector’s proclamation. And anyone who had dealings with them is keeping low, she thought, even going as far as to destroy any of their goods they have rather than try to sell them. Which would probably lead to some economic issues as the trade dried up, she knew. The only people who did more trade than the Vendakar were the people of Boir, but relations with the Grand Duchy of Boir were tense. That tends to happen when you take power by killing off your uncle and his entire family, Kerrel thought sourly. She had seen much of Hector’s ruthlessness, but it still shocked her to think of just how willing he was to kill if he saw it as the best course of action. She knew the murder of his relatives weighed upon him, but he seemed to view it as his only course of action. Just as he views sending me south to make peace as his only option, she thought. Kerrel nodded in approval, though more for the thought he put into it and the economic implications he saw than in agreement of his final outcome. “Those taxes of his… and the way he took power, those caused him some issues in the South.” She sighed. Really, talking this over in the street was hardly the ideal location. While most people in Longhaven had their heads on business rather than listening in, it wasn’t beyond the realm of possibility that there were spies abroad. She was certain there would be some who would pay to hear what Lord Hector’s recently promoted Commander of Cavalry and Ducal Investigator had to say about it all…and what she did have to say could be damaging. “Commoners are worse, though,” Baran grunted. Jonal pondered that and Kerrel hoped he would see the lesson and learn from it. The single-minded determination of Duke Hector the Usurper was admirable, in some ways. He certainly had spared his lands from the savage violence that had descended upon Boir, but he had brought a different kind of savagery to Masov, one where the people no longer trusted in their protectors, one where families on the ragged edge had to start thinking about survival come the long winter ahead. And if anyone understands how brutal winter can be, it’s the Duchy of Masov, she thought. The coastal Duchy often had the heaviest snowfall of all the Five Duchies during the long months of winter, with the southern highlands receiving forty or more feet of snow. Some places, she had heard, had up to eight months of snow-fall. They came at last to the Black Oar Inn. The cheery sound of laughter and the warm glow of light from its windows “So what can we do?” Jonal asked, his voice uncertain. “What we must, to keep the peace,” Kerrel said softly. She thought, suddenly of Lord Hector’s private discussion with her, before her departure. He asked me to be his assassin, she thought, knowing full well what it would cost me. She wasn’t sure she could do that, but she knew full well the stakes. Civil war loomed, with the dead Duke’s daughter backed by the southern nobility and the commoners and Hector backed by the northern merchants and tradesmen. That kind of war would leave the Duchy of Masov shattered, much like her own home of Asador. Could she kill an innocent woman to preven that? Even if I do kill Hector’s cousin Katarina, Kerrel wondered, would it do any good? Here’s the first snippet from Wrath of the Usurper, coming on 30 May! As the young woman crawled away, Tarjak smiled. She was a soft, southern thing, one of their nobles that his men had captured or so she had claimed. He, of course, had claimed her and it had not taken long to break her to his will. It had given him a unique feeling of power to take a proud and arrogant woman and make her into an abject slave. It was something he rather enjoyed. Tarjak whipped to his feet with the speed and grace which had made him his clan’s chieftain. His sword in hand, he confronted the shadowy figure who stood at the end of his fur bedrolls. His blade lowered, though, as he recognized the hooded figure who clutched at a staff. “Oh,” Tarjak grunted, “It’s you… my Lord.” It grated on him to say the last, but he knew better than to deny the wizard his due. Tarjak knew well that he owed much of his own position and power to the other man. Xavien gave Tarjak a smile, “If you are busy, I could always come back.” The softness of his voice didn’t fool Tarjak. It was as much a rebuke as if he had slapped Tarjak in the face. Tarjak knelt, “My apologies, I am fully at your command, my Lord.” He felt sweat break out on his forehead and his back tingled in anticipation of pain. Xavien’s favorite tools were fear and pain, Tarjak knew. It was part of why he was so effective at gaining the loyalty of his fellow Semat Armen… those were some of the only techniques they respected. “What?” Tarjak asked. “But, we’ve taken so much loot, so many slaves, and many stockpiles of food. Why withdraw now?” Even as he said it, he realized his mistake. Green energy lanced out and Tarjak dropped to the ground, his teeth clenched on a scream. As an Armen warrior, he knew pain, both how to give it and how to take it. As the chieftain of his clan, he knew that his survival required he not show any sign of weakness… and shrieking like a girl as the green energy seared his flesh was not something that would make him appear strong. Tarjak tasted blood from where his teeth had torn the inside of his lips. He also smelled scorched hair and had little doubt that his skin would show the effects of Xavien’s attack in broad scorches and pain that would last for weeks. He rose to his knees again, though, and waited silently, either for more punishment or for his master to speak. To do otherwise would just bring worse. “However, since you clearly didn’t understand me and no doubt you’ll have to argue down your tribesmen, I’ll tell you why.” Xavien leaned on his staff and Tarken could see that the wizard actually looked tired. Which means something wore him down, Tarjak realized with shock. Over the years that he had known Xavien, Tarjak had seen at least a dozen shamans challenge the wizard only to die, often in painful or embarrassing fashions. None of them, to include the most powerful shamans of the Semat, had been able to give him pause. If something had worn him, tired him… it must be a terrible foe indeed. Tarjak wasn’t quite certain whether to hope the foe had defeated his master or been defeated. While my fate is tied to his… I hate him enough to hope for his death, he thought, and I would go to the spirits a happy man to know he had been brought low. “War with Hall Prakka?” Tarjak asked eagerly. While fighting the soldiers of Boir was enjoyable enough, the mercenaries and soldiers of Hall Prakka were more likely to fight in close combat and less reliant upon magic and deception. It felt more pure, somehow, to engage in that manner of war. Plus, he liked the mixed blooded women of Nasar Ind. They had spine and stubbornness. He had once captured a powerful priestess there… and he still remembered with pleasure how long it had taken his shamans to break her… and how he had used her body in that time. Tarjak nodded, even as he thought of how that would affect his people. They had always sent the most reckless warriors into combat first, to thin their numbers and to give the survivors combat experience. It also let more experienced warriors survive to face the enemy feeling well-rested and ready. This would be no different, save that his best and most loyal tribes would be the first to leave. They would be able to take most of the supplies from the raid camps at Nasar Ind. The other tribes, when they reached there, would have to forage or raid for supplies to make the final voyage to their homeland in the north. Also, as summer departed, the northern seas would grow more and more dangerous. Whatever forces trailed the furthest back would not only lose more warriors to the enemy… they’d lose many men to the seas. Tarjak nodded, though in reality he didn’t want his tribe to live in these soft lands. The had already become sluggish and soft in the siege. He looked over as the slave girl brought him a tray with a glass of southern wine and slices of meat. Tarjak gave her a friendly smile as he took the tray. He reached out a hand and brought her to her feet. Tarjak could feel the rapid, nervous beats of her heart, as fear worked through her veins. Tarjak’s smile turned ugly as he brought his sword up, under her ribs. The woman let out a gurgling shriek and Tarjak felt hot blood gush over his arms. He smiled as she sagged, a look of shock and terror on her face. “Why…” she gasped. “You were a good slave,” Tarjak said. “But you saw too much. Besides, you are to soft to bear my seed… and I know you are pregnant and I’ll not see my blood diluted with the weaklings of the south.” He wiped his blade on part of her ruined silks and let her fall to the floor. He watched as she crawled away, leaving a vast trail of blood across the furs and carpets of his tent. Tarjak might enjoy the softness of the south, but he did not need it. Harshness and hardness had shaped him and his people… at the command of Hall Armath, the Dark Warrior. Whatever the wizard thought, they would follow the Dark Warrior’s commands. They would be his people: savage, vicious, and harder than the stone of the mountains.